Tip: To find a docket number, look in the reported decision or search the WSCCA system. Enter WI Reports, North Western Reports, or WI Public Domain case citation. Not all cases are indexed by citation. 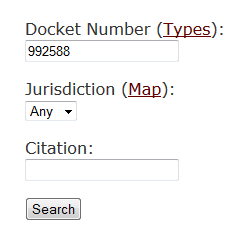 Tip: To find an exact match, enclose citation in single quotes: eg "2002wiapp10"
Tip: To view a map of Wisconsin Court of Appeals districts, click on the "jurisdiction map". Search results are displayed next to the search box. Letters following the docket number refer to brief type. To view a list of brief types, click on "Types" next to the Docket Number search. in the search box above. 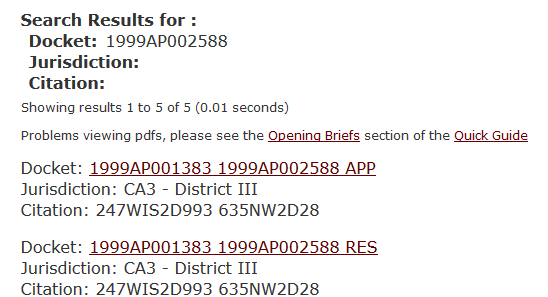 To open a brief, click on it in the docket number column. Briefs are available in PDF format. Save a brief by right clicking on it in the docket number column. Choose "Save (link) target as" and save the file to your desktop or another location. When opened, a scanned image of the brief will appear in your adobe acrobat viewer. Because it is only an image, text searching or copying is not possible. * On April 4, 2005, the Clerk of Supreme Court's office changed to a new case management system. As part of this change, the docket number format for Supreme Court and Court Appeals cases has changed. The new docket format contains the year, followed by the letters AP (appeals) and the case number. For example, docket number 99-1234 will now be displayed as 1999AP001234.